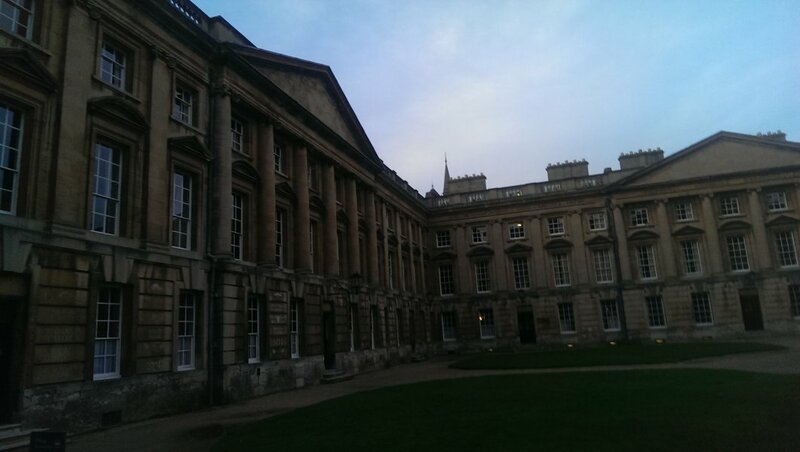 The oldest university in Britain. 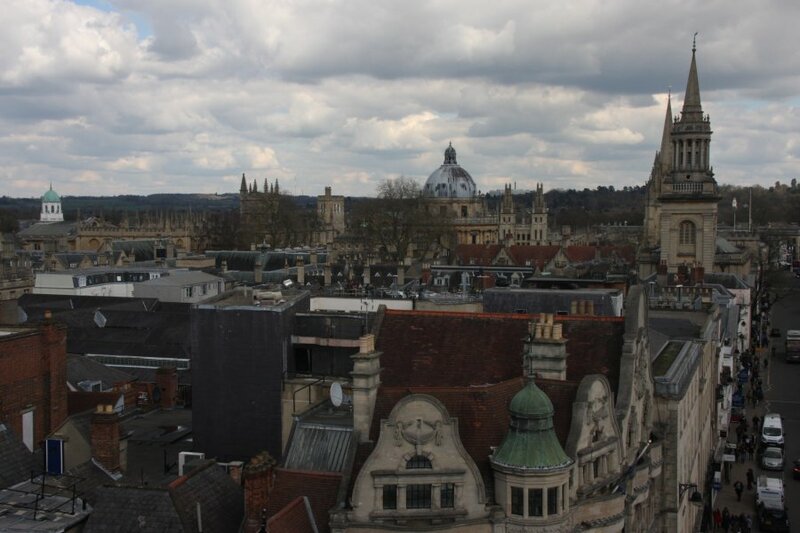 Oxford is a city that is known throughtout the world for its university. The university itself is split into multiple colleges, with education beginning in the year 1096, just 30 years after the Norman invasion. 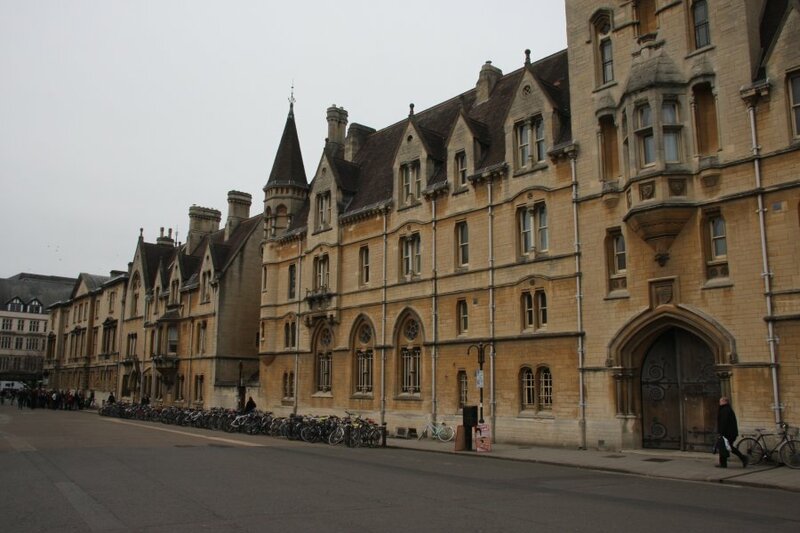 In 1167, the English king banned English students from attending the University of Paris, so Oxford took in the English students, and grew accordingly. 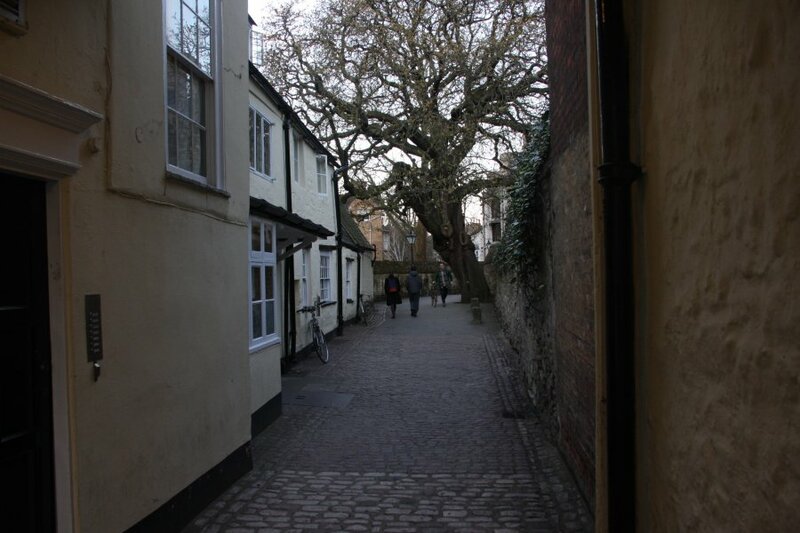 (In 1209, after a townswoman was accidentaly killed by a faculty member, the townspeople executed some of the faculty members, causing others to flee and set up Cambridge University.) In 1248, it was given a royal charter, formally establishing it as the univerity that it had already been for over 150 years. 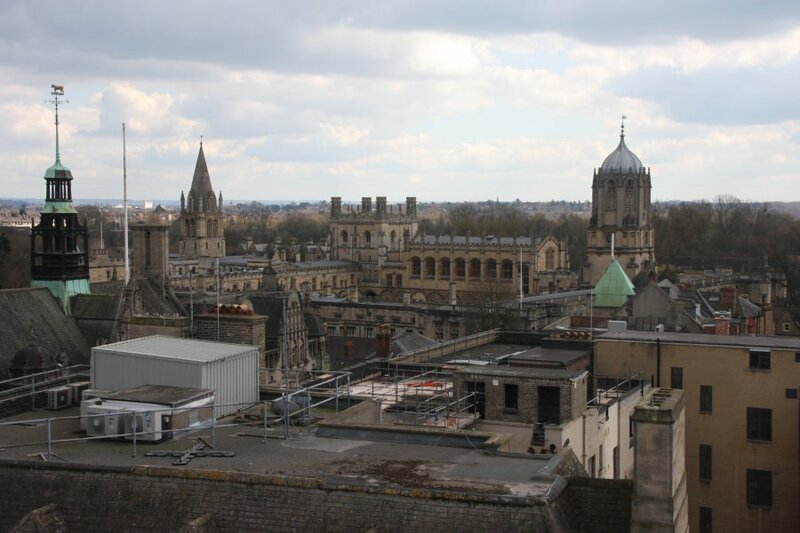 In terms of start date, Oxford was far from the earliest academy, with Plato's academy being the earliest known, starting in 387 BC. However, it is the second longest operating university in the World, surpassed only by the University of Bologna, by just 8 years. 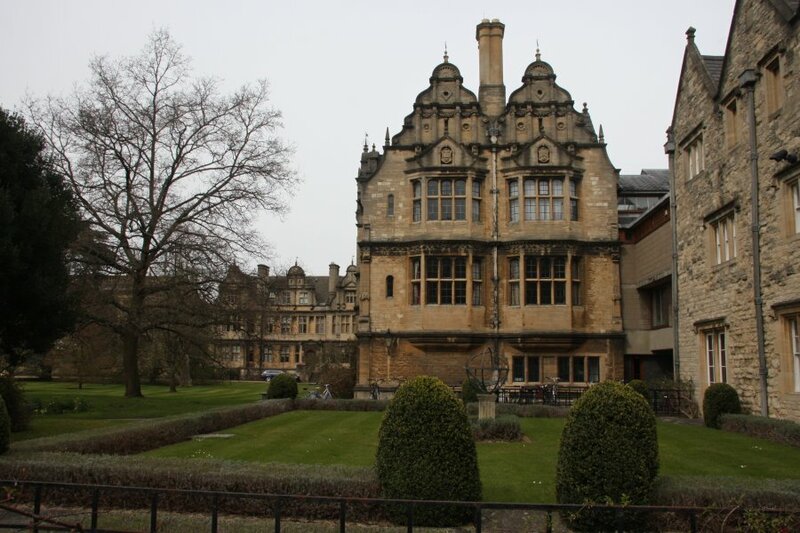 It is claimed to be the Oldest University in the English Speaking World - a pretty meaningless title, especially since when it was established, modern English did not exist, and until 1960, the university still required students to be educated - at least partially - in Latin. Before that, it also required Ancient Greek. 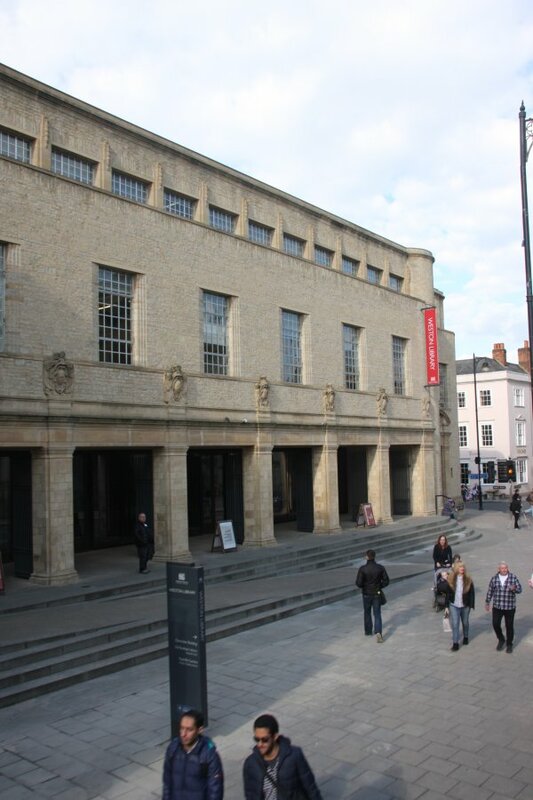 Oxford University does, however, produce the difinitive record of current British English. Oxford university still holds on to its many (oh so many) quirky traditions. Crazy, esoteric traditions, with their meanings almost lost in time. Beating the rocks at the boundary of their land. Wearing university gowns to dinner. Using the local longitudinal time instead of the British timezone (5 minutes different - at least you are less likely to be late to class). Saying a colege-specific grace in Latin. Singing the story of a wild boar's demise before a feast. Still, it remains one of the most prestigious universities in the World, and one of the greatest education establishments. 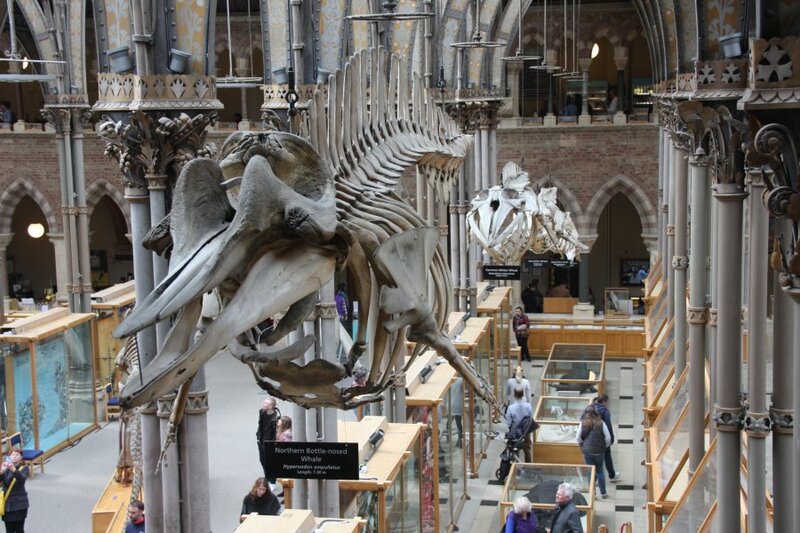 Beside that, it is difficult to remember that Oxford is actually a city with a life and history of its own, so you will have to excuse me if this gallery concentrates a little too much on the university, and a little too little on everything else. 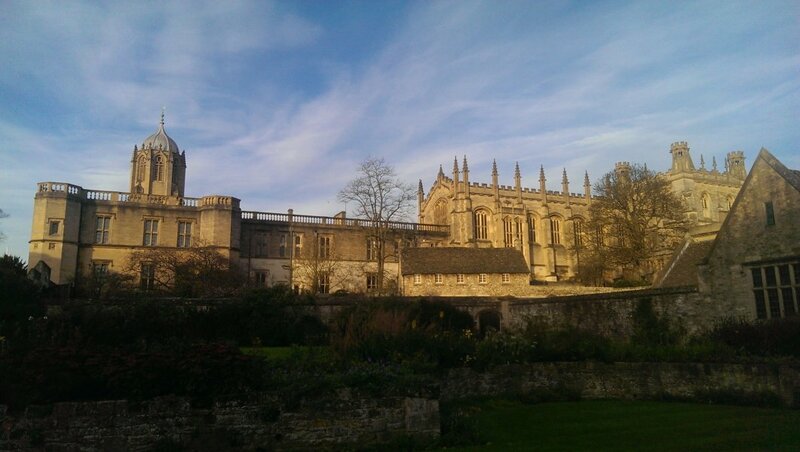 Christ Church College, one of the best known of Oxford's colleges, and its second most valuable, at around half a billion pounds. It was established in 1546. 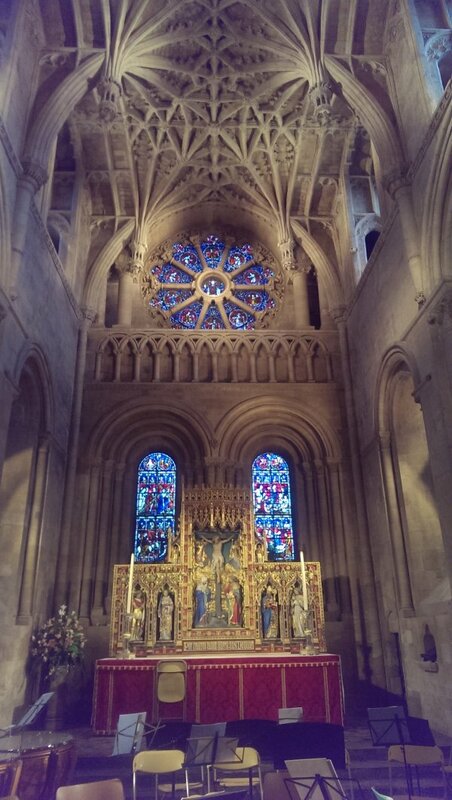 The pictures of this area were taken by Becci using a 2013 phone, since I did not bring my proper camera for it. The queue for tourist admission into Christ Church college. Tree holding up the wall. Wall holding up the tree. 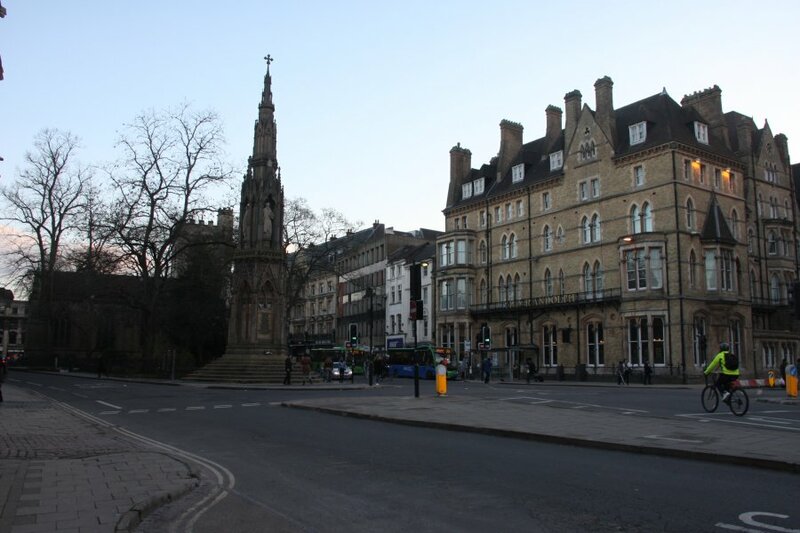 Much of the historic buildings appear in popular TV shows and films. In particular, this was used for the Harry Potter film franchise. 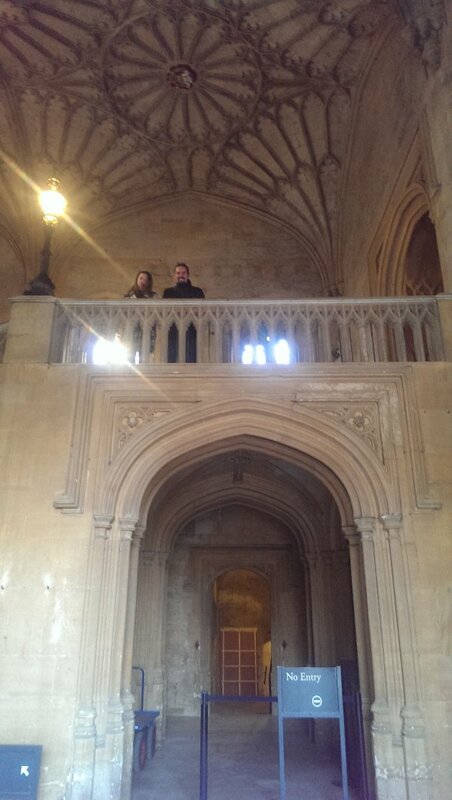 These stairs were where Neville Longbottom dropped his toad, and where Harry is reunited with Ron and Hermione. Alright there, Ron? 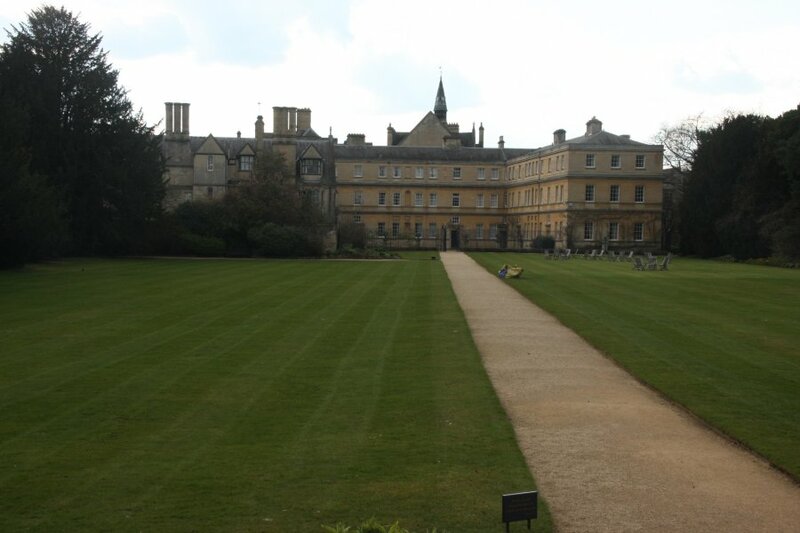 Tom Quad, the Great Quadrangle. Because "square" is too easy. 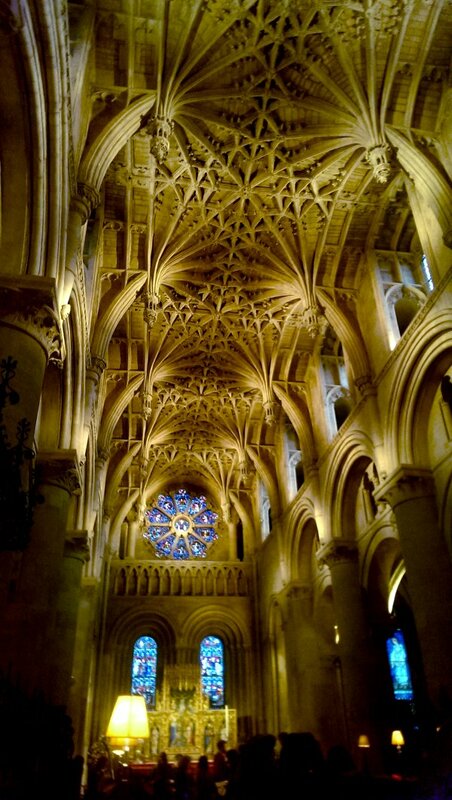 You might remember this from various episodes of Inspector Morse. 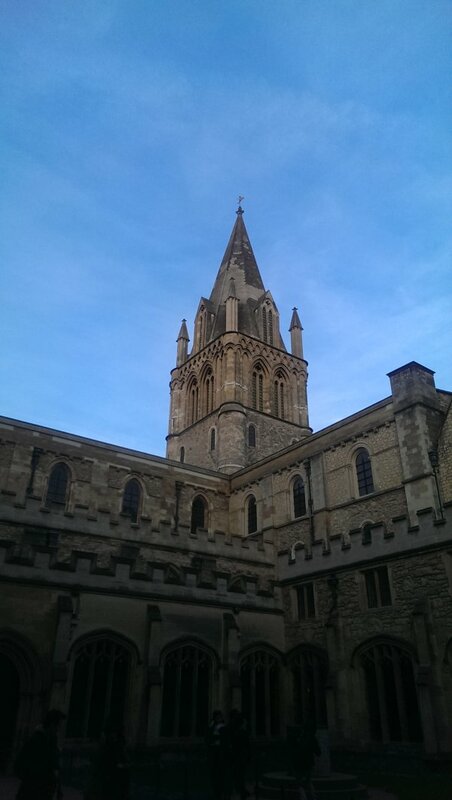 Christ Church, with the cathedral tower on the left, the squat tower of the stairs in the middle, and the quadrangle gateway tower on the right. 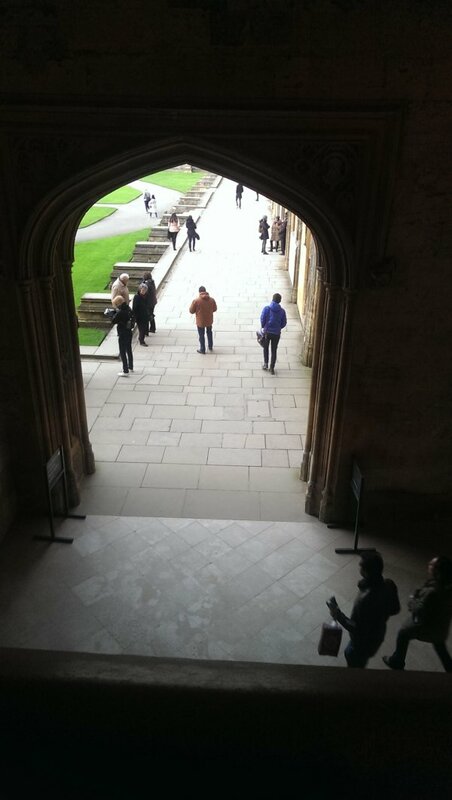 The Great Hall lies between the last two towers (at the top of the stairs). It is the basis of the Hogwarts Great Hall in the Harry Potter films, but without all the CGI. Photos are forbidden but that doesn't stop people - search for them on Google Images if you want to see what it looks like. Students eat their dinner there, in their robes. Tower of Christ Church Cathedral. Organ. 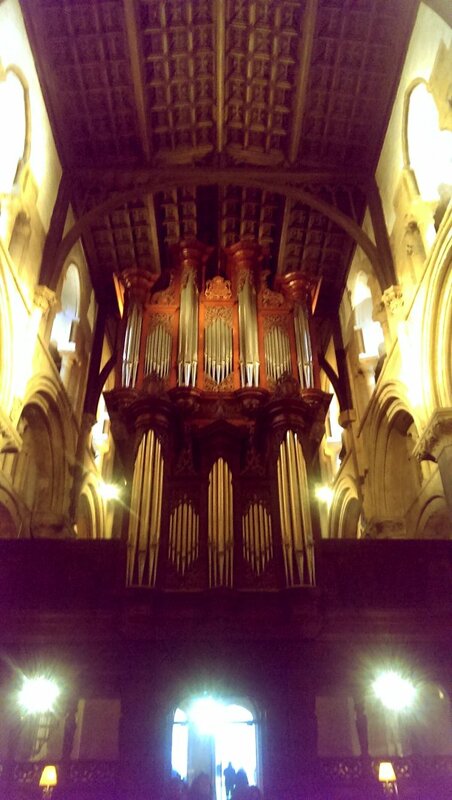 The person in the doorway is in false perspective, but the organ really is very big anyway. 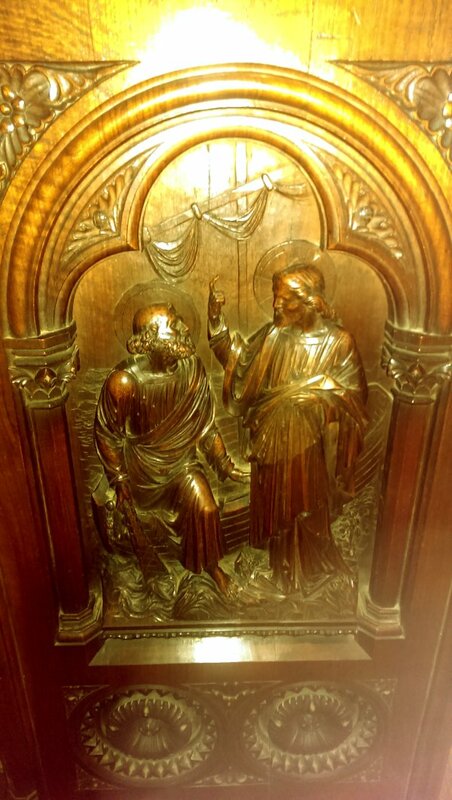 Carving on a pew. "Look what I just picked out of my belly button". Sundial. Presumably set to Oxford time. Dormitories as grand as a mansion. Christ Church's Library. Panorama auto-stitched by the phone. Back gate. With nobody checking tickets here, visitors could easily get in without paying. But that just wouldn't do, would it? Panorama auto-stitched by the phone. 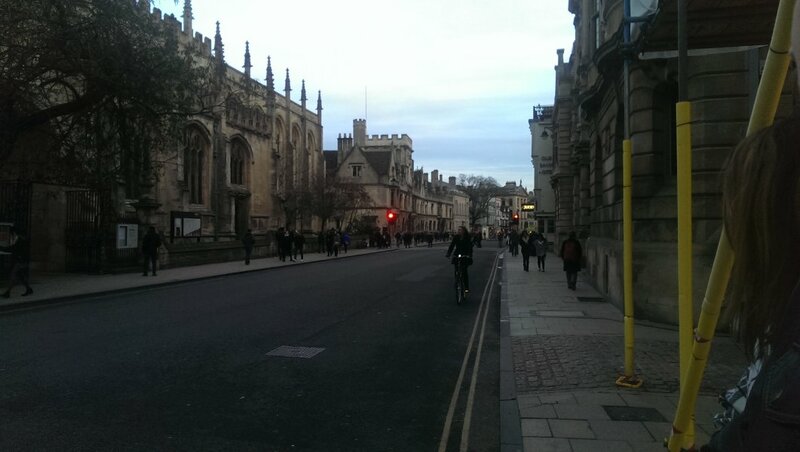 High Street, with University Church, and a student bike. 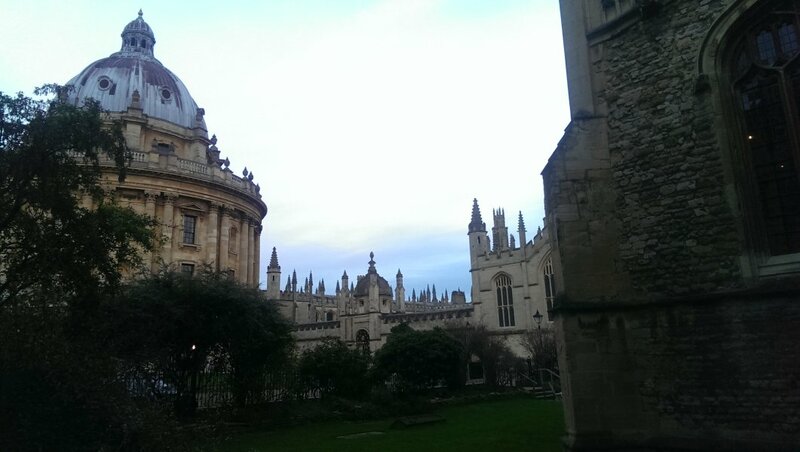 Radcliffe Camera and the gothic spires of All Soul's college. 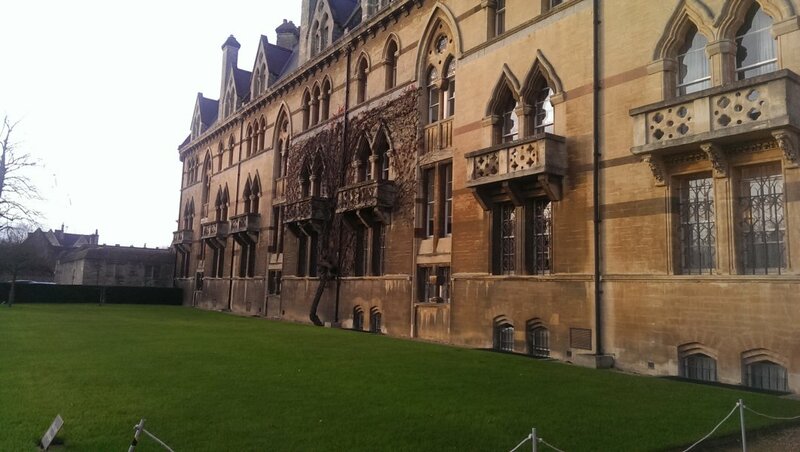 The college dates from 1438, and is only worth a mere third of a billion pounds. A pittance. 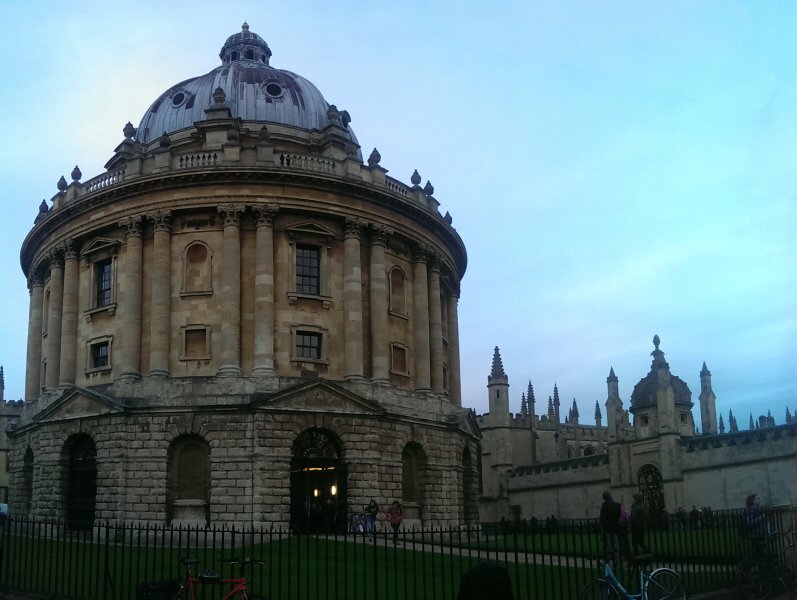 Radcliffe Camera is a university library, completed in 1749. Behind it on the left is the older Bodelian Library building. This is the last of Becci's phone camera pictures. New Bodleian Library, the second largest library in the UK, and another part of the university, with its older counterpart dating from 1602. It is a copyright and research library, and can (and tries to) request one copy of every single work published in the UK and Republic of Ireland. At present, there are 12'000'000 works in the library. The building is not big enough, so the vault extends under the surrounding streets and buildings, and in total 8'000'000 are also stored elsewhere in other towns and cities. The Clarendon Building - former home of the Oxford University Press, dating from 1715 - and the Sheldonian Theatre dating from 1669 (primarily for music performances and ceremonial use). This panorama, and all following ones, were automatically stitched using Microsoft ICE. It really struggled with this one, because the two source pictures were taken from different vantage points, and it couldn't work out how to modify the perspectives to match each other - lines ended up misaligned, people and cars ended up cut in half. In the end, I cropped the pictures to force the stitch locations, and then manually edited away the worst errors (you can still see the white lines misaligned on the road). 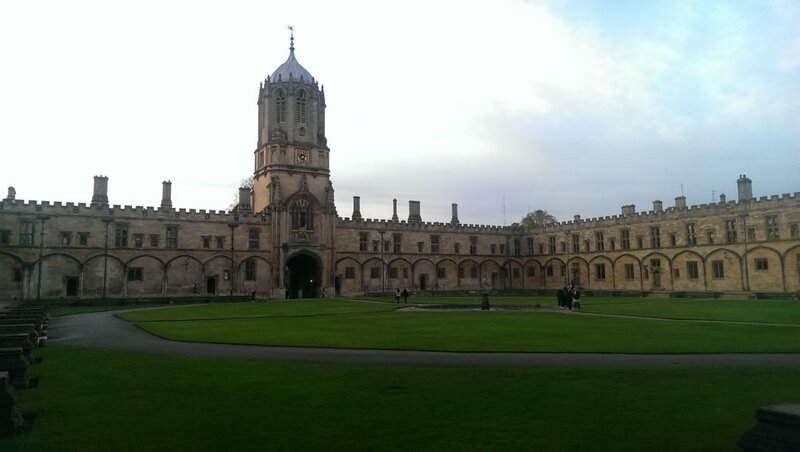 Trinity College, the 1555 Oxford one, not the much more famous Cambridge one. 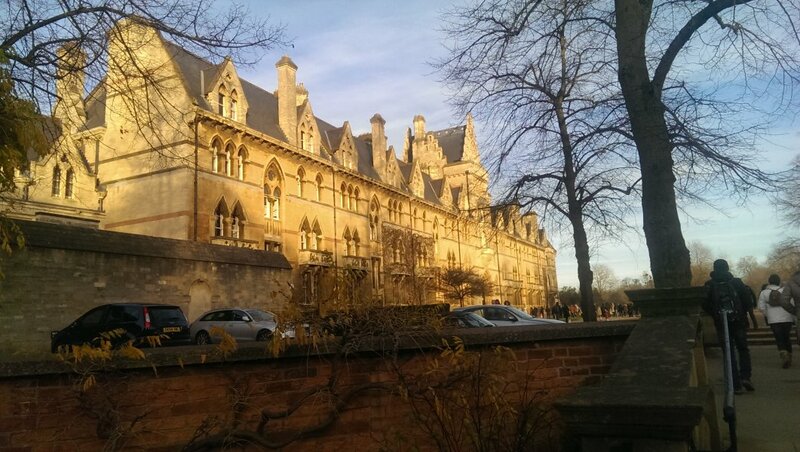 Balliol College, one of the oldest, dating from 1263. 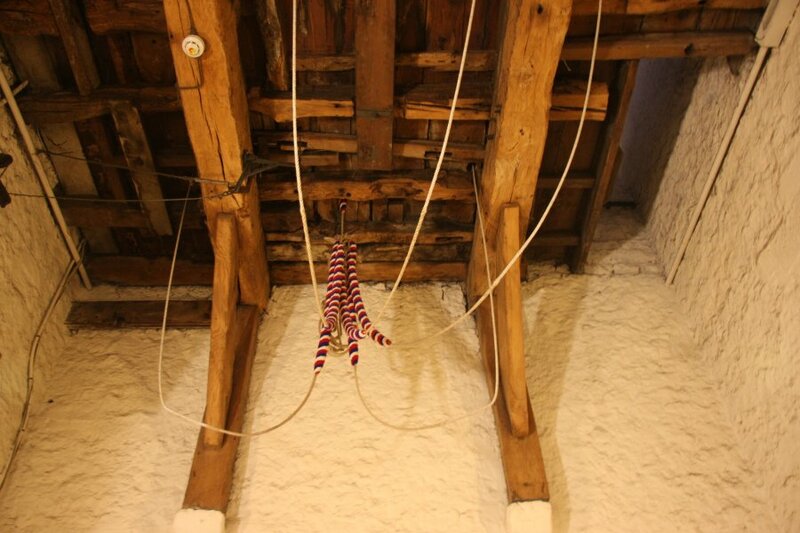 Bell ropes in the Carfax Tower. 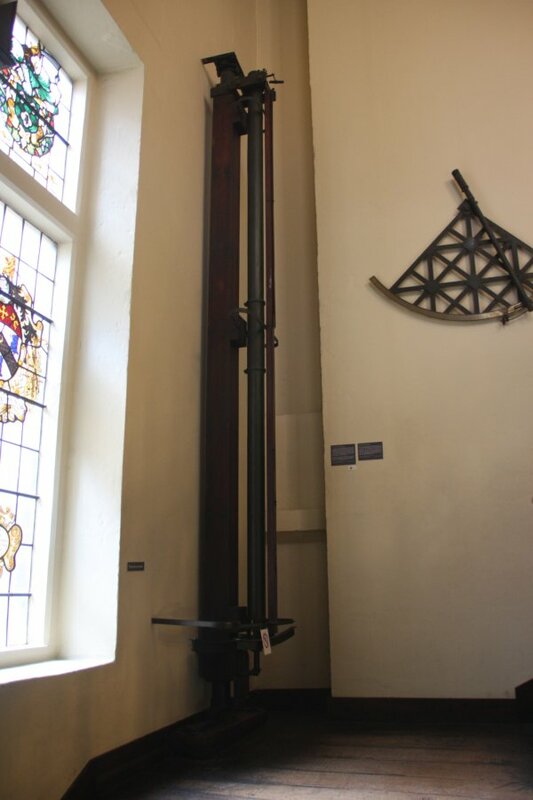 This tower used to be part of St. Martin's Church, dating from 1122, but the church no longer exists. At 23 metres tall, it is the tallest building in the city centre, where taller buildings are not allowed. Helical staircase (yeah, spiral is a misnomer) to the top. View from Carfax Tower. 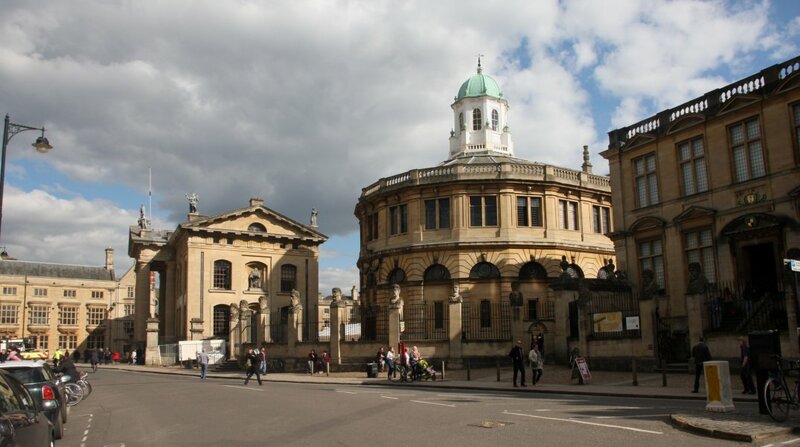 On the left is the green tower of the Sheldonian Theatre, followed by the spiked tower of the Bodleian Library, the square tower and round turret of Hertford College (1282), the Radcliffe Camera dome, the twin spire of All Soul's College, the University Church tower and Licoln College Library tower. Martyrs Memorial, a tribute to three Protestant martys, dating from 1843. 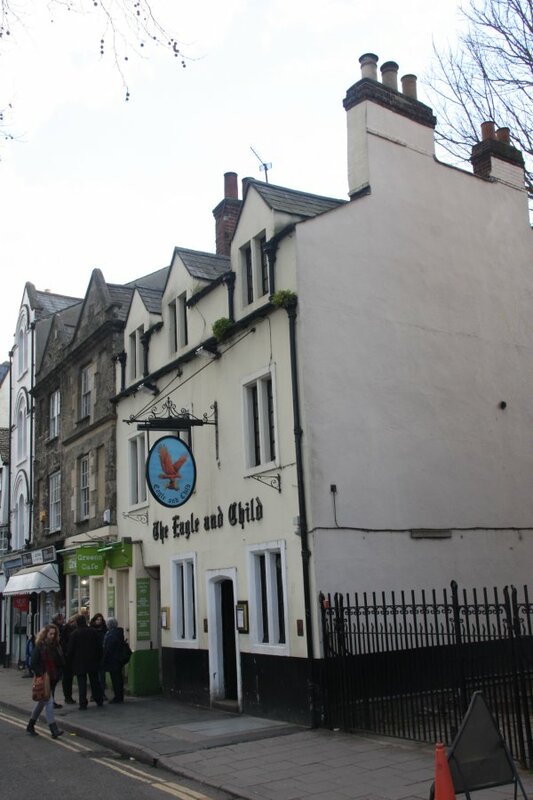 The Eagle and Child, affectionately known as the Bird and Baby. 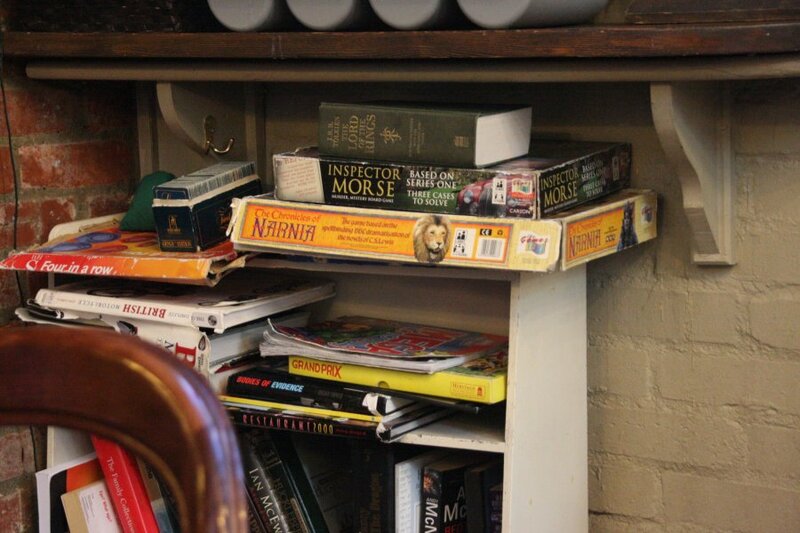 In the Eagle and Child. 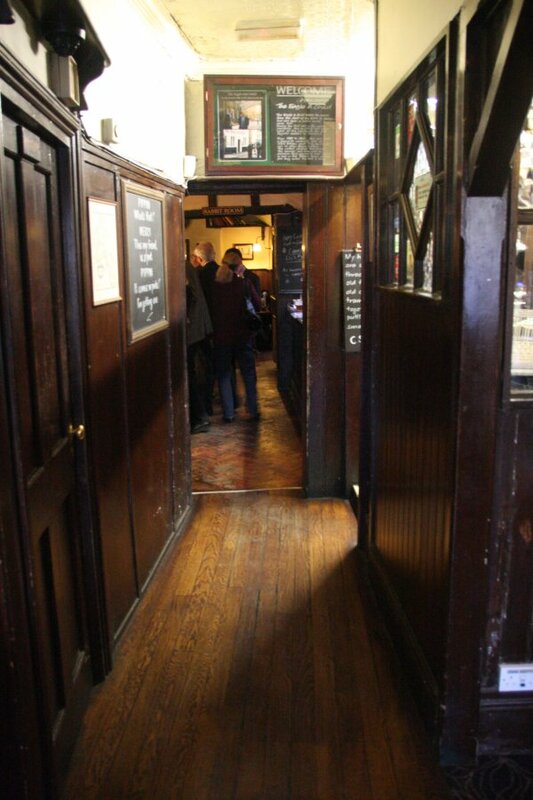 Famed for being one of the preferred pubs of friends J. R. R. Tolkien and C. S. Lewis. 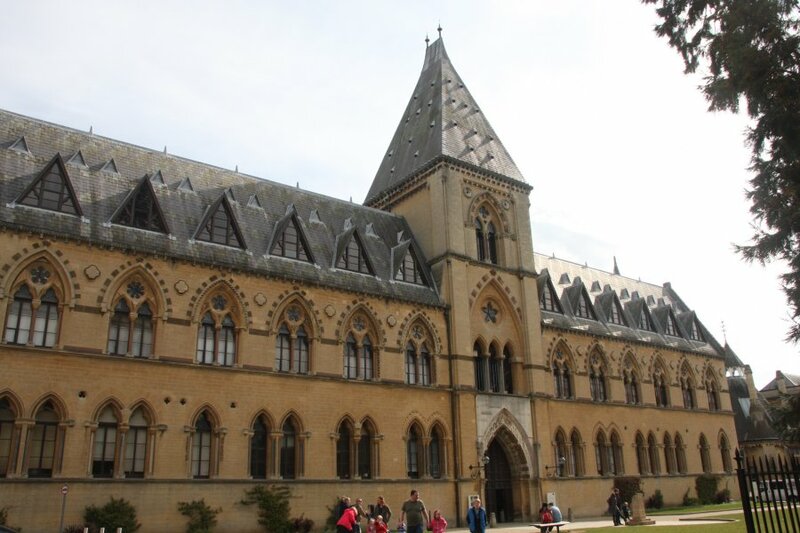 Each wrote their famous books here in Oxford, and drafts of The Hobbit, Lord of the Rings, and the Narnia series were originally read out here to their friends in the Inklings literary group. 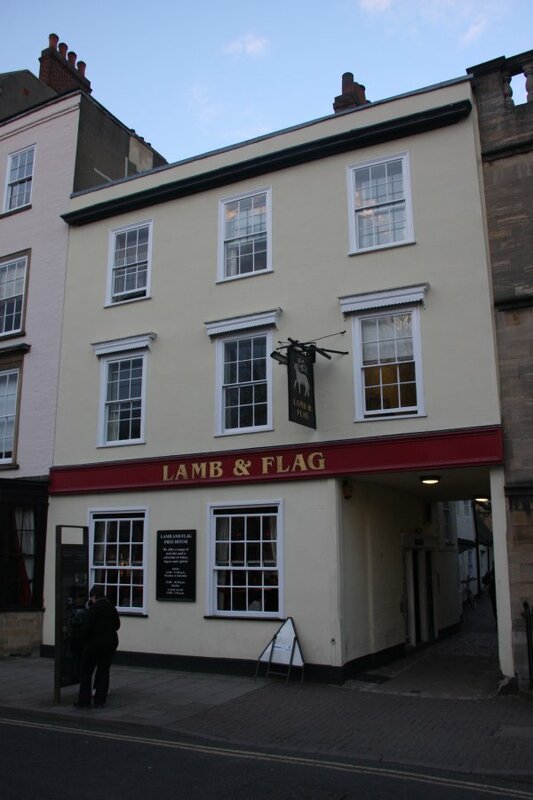 On the opposite side of the street is the Lamb and Flag, another popular pub for the Inklings. Lamb & Flag Passage (a name I recognise from Ogof Draenen - a part found by Oxford University cavers). 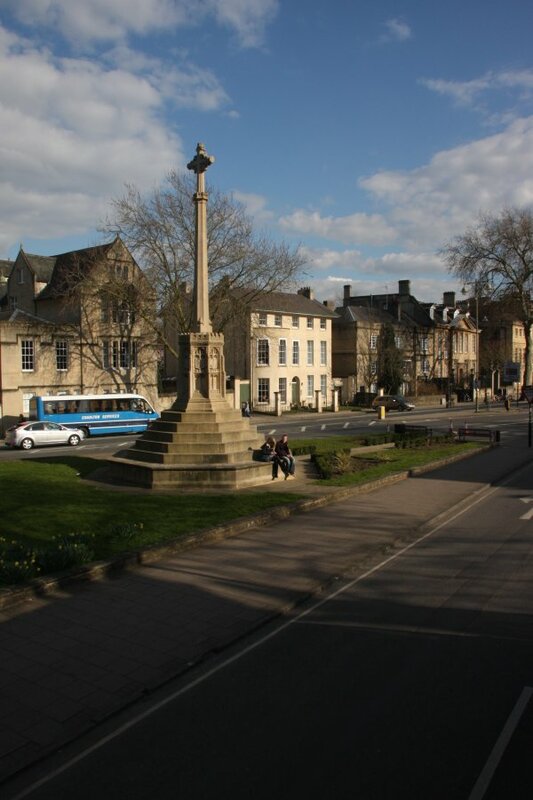 War memorial at the junction of Woodstock Road, Banbury Road and St. Giles (another Ogof Draenen name). Oxford Castle, showing A wing (now a hotel), the debtors' tower, D wing and St. George's Tower. 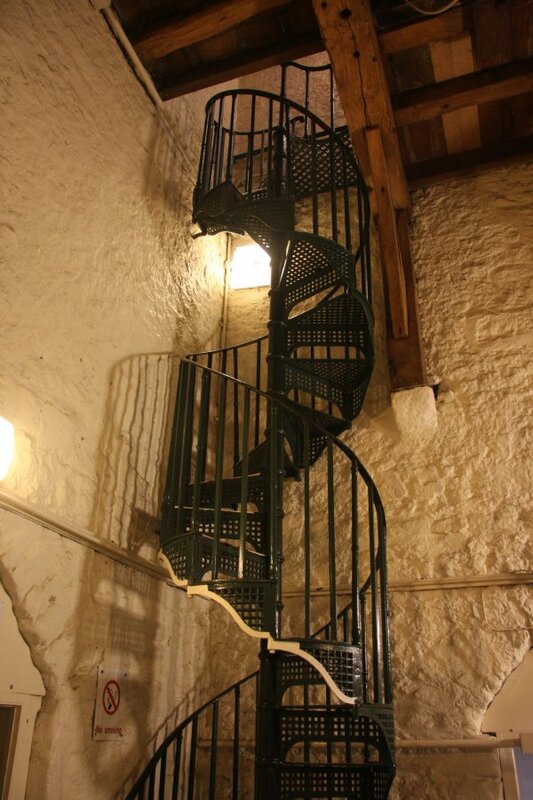 At various times, different parts of it have served as prisons, with St. George's Tower being the old prison tower, and the wings being a more modern prison. 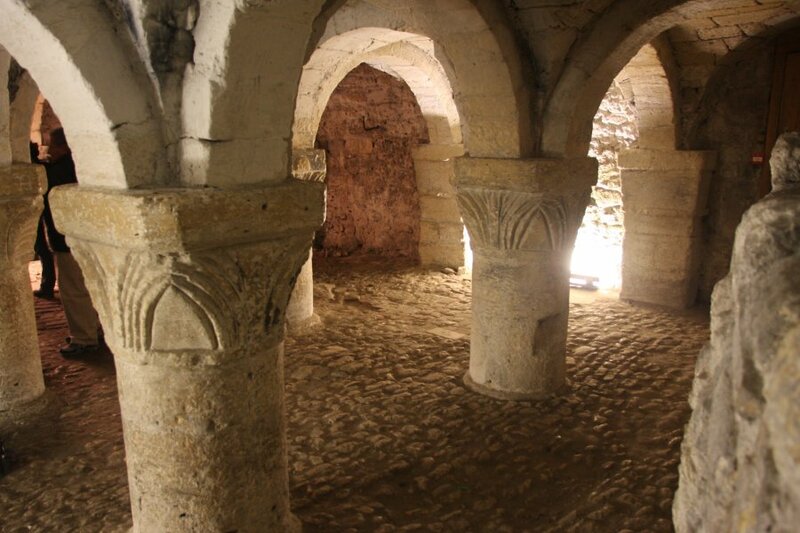 St. George's Tower is likely to be Saxon, predating the main castle, which was constructed in 1071 by the Normans. The tower is therefore the oldest surviving secular structure in England - all older structures are either religious, or in ruins. In St. George's Tower. When this was a Victorian prison, there was a capstan here which pairs of prisoners would turn, pumping water into the tanks above. 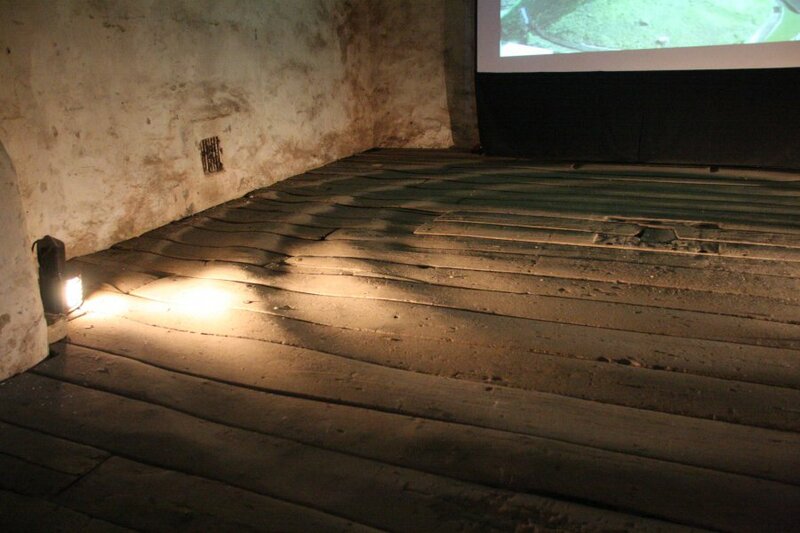 The prisoners spent so many collective hours walking in circles that they wore the ripples into the floor. The water tanks in the tower. This tower had previously been used in the civil war era (1650ish) as a prison, basically a place to forget about people, crowding them in here, and letting them starve to death on extremely meagre rations, and only removing the bodies once the remaining survivors were to weak to fight back. Pretty gruesome. View from the tower. On the left is the original Norman motte dating from 1071, with the rest of the buildings being from the Victorian prison. Almost none of the Norman castle remains, having been dismantled after 1646, and replaced with a gaol in the 1650s that later became the extensive prison. Into the 18th century, prisoners would have to pay for their own upkeep, including any food, and to have their waste bucket changed. If no funds could be provided by the prisoner or their family, the prisoner would die of starvation. 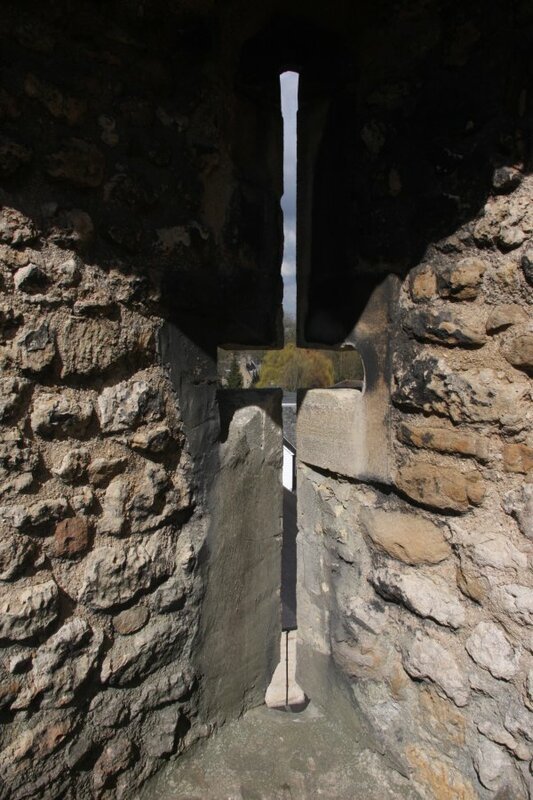 Arrow slit in the tower. The top of the motte is hollow; hidden under it is a well room, and a deep well dropping down below the motte. 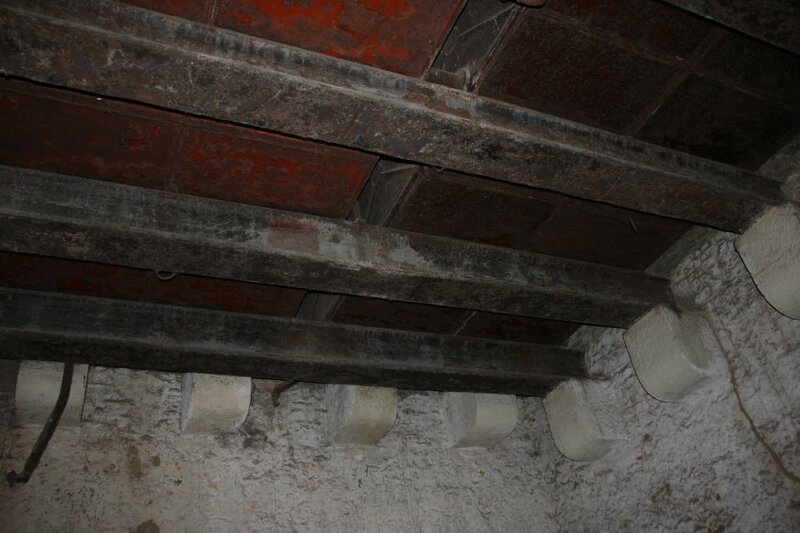 Crypt of St. George's Chappel, blocked up and rediscovered later. This may also be Saxon in origin. A TV show that attempts to look for the Most Haunted locations in Britain did an episode here, getting all excited about a heat presence at one point. Turned out it was a heater pipe in the wall. Yeah, people making each other afraid in the dark. Stupid show. 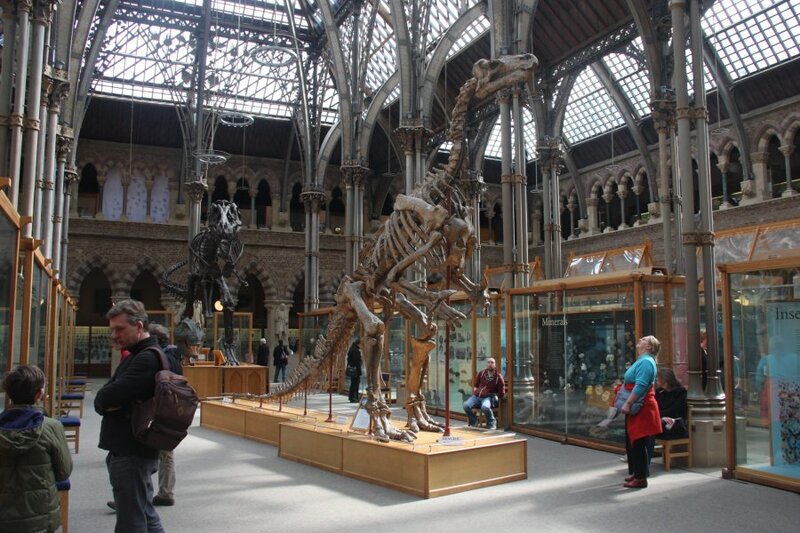 In the Museum of the History of Science (next to the Sheldonian Theatre). 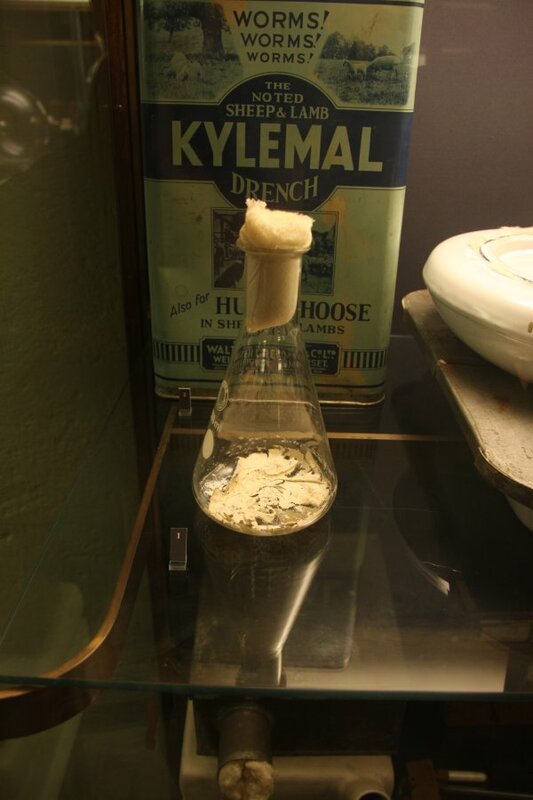 This is an original culture of Penicillin, dating from World War II, roughly 1940. This marked the first significant scale production of antibiotics, and a turning point in treatment of human diseases, allowing Penicillin to move from small scale research into actual medical treatment. 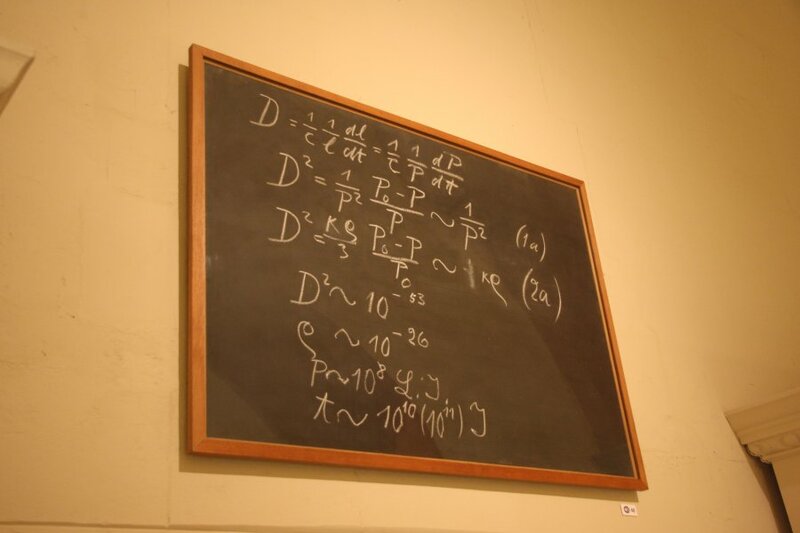 Blackboard from a lecture given in Oxford by Albert Einstein in 1931, on his theory of relativity. The formulae describe the expansion of the universe, and its age. Zenith sector and quadrant. The zenith sector dates from 1773, and was used to prove that the Earth orbits the Sun, from the steller aberration that could be observed. A major scientific revelation of its time. 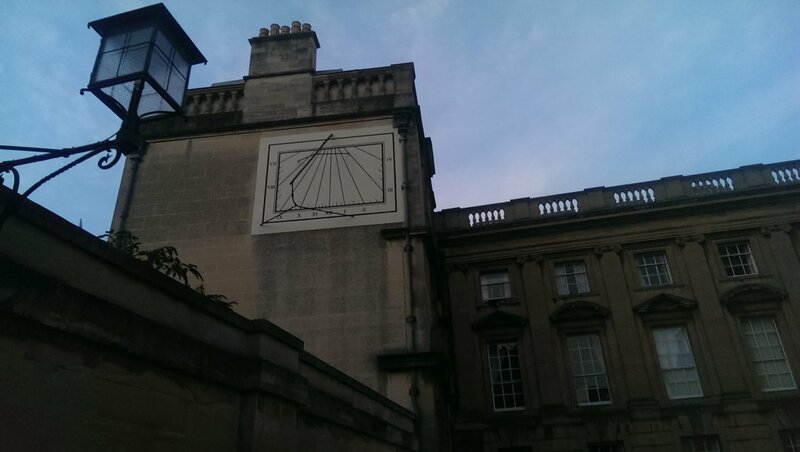 The quadrant, meanwhile, was used to measure the latitude of Oxford in 1767. 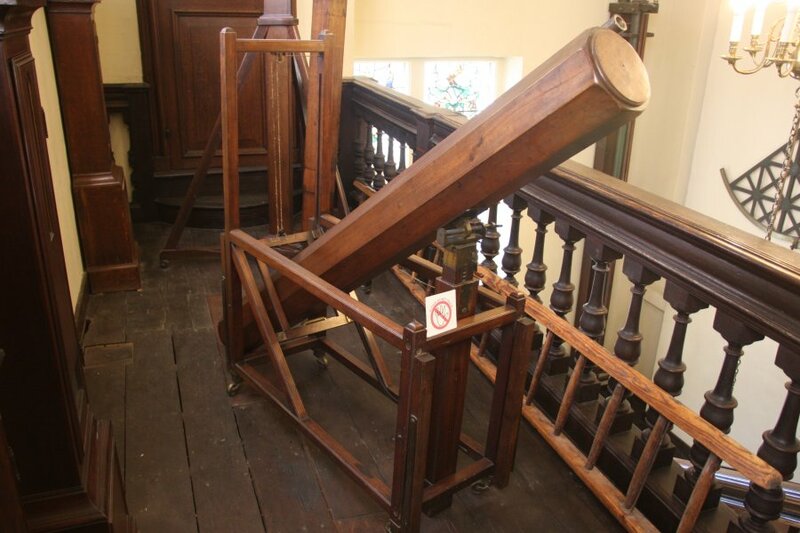 Newtonian reflector telescope, a design created by William Herschel and used to discover the planet Uranus in 1781. This particular one was made by him in 1795, based on his original design. 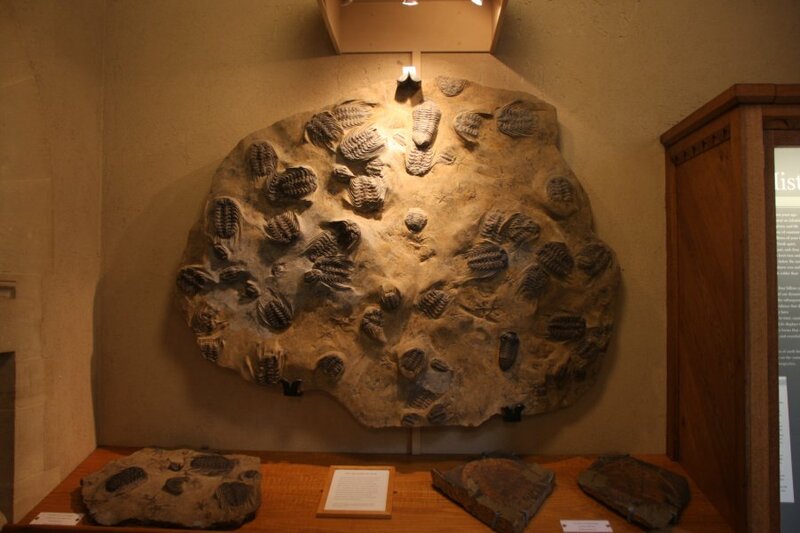 Of course, for me the main attraction is dinosaurs, starting with this Iguanadon bernissartensis cast. Edmontosaurus annectens (cast) - these are abundant as fossils, and museum exhibits don't normally need to be casts. 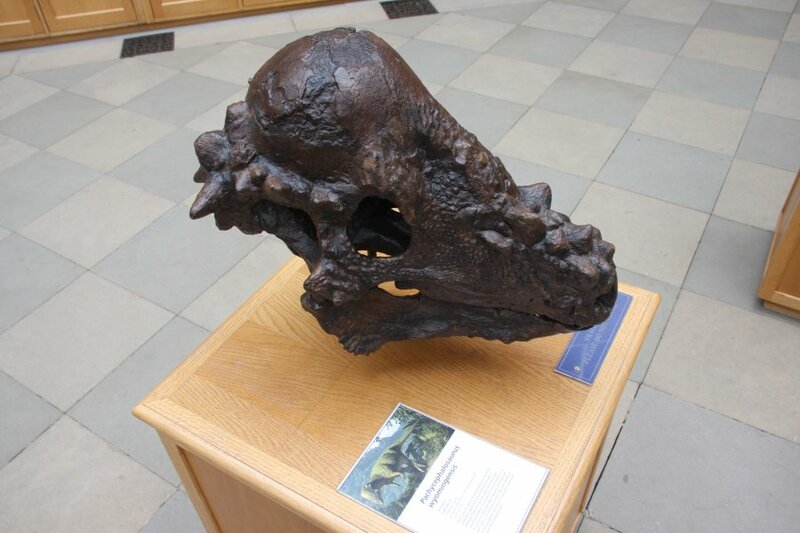 Pachycephalosaurus wyomingensis skull cast, the dinosaur with the large skull bone for headbutting others. 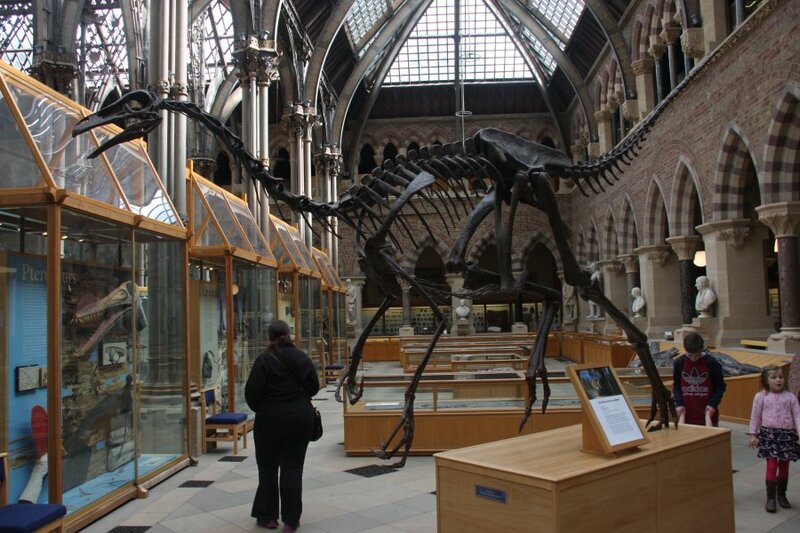 Struthiomimus sedens cast. 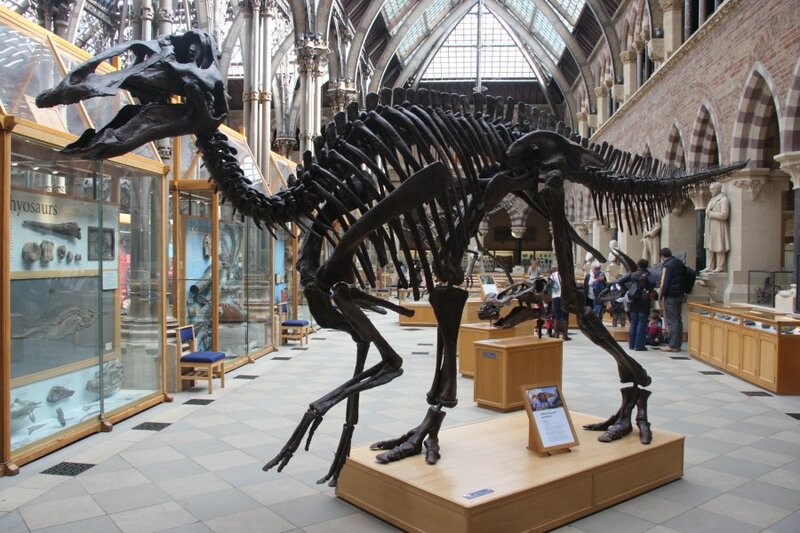 These are more like modern ratite birds (eg. ostriches), with a toothless beak. The teeth are normally used to determine likely diet, so their diet is unknown. Based on their abundance, they are assumed to be herbivores or perhaps omnivores. Bambiraptor feibergi cast. 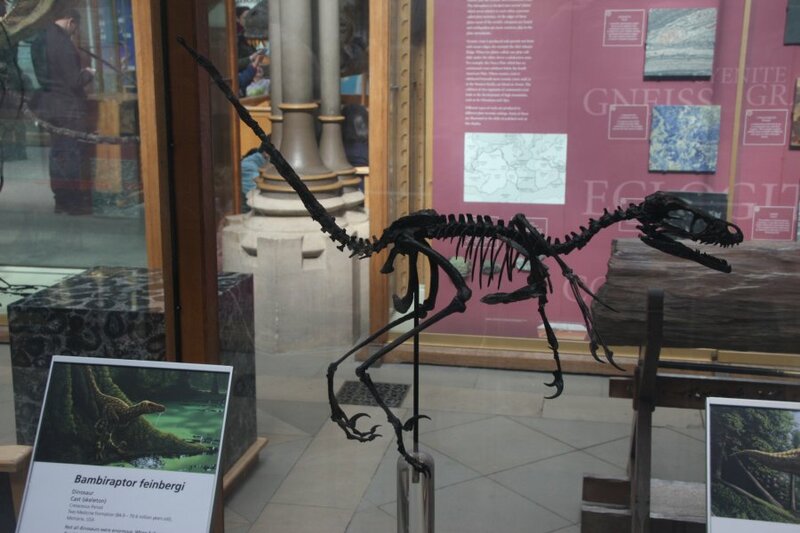 One of the little ones, related to velociraptor, and with the typical dromaeosaurid claw. 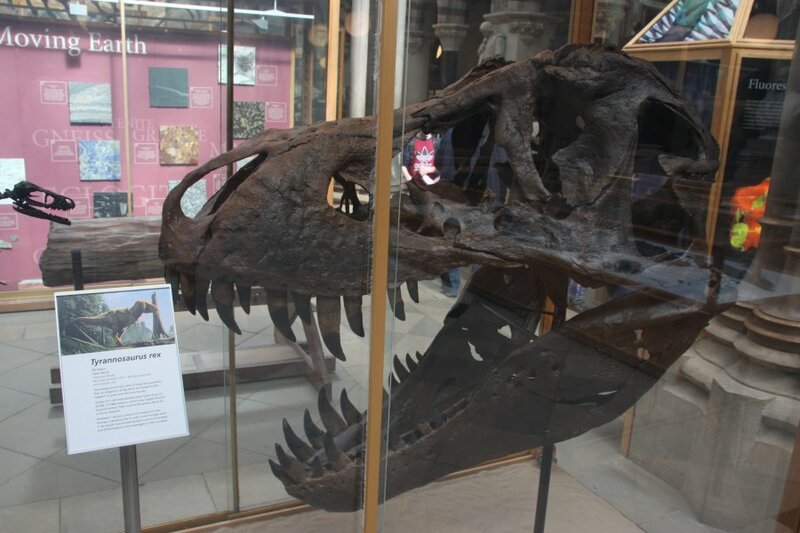 Tyrannosaurus rex skull. Probably the same cast as all the other museums use. 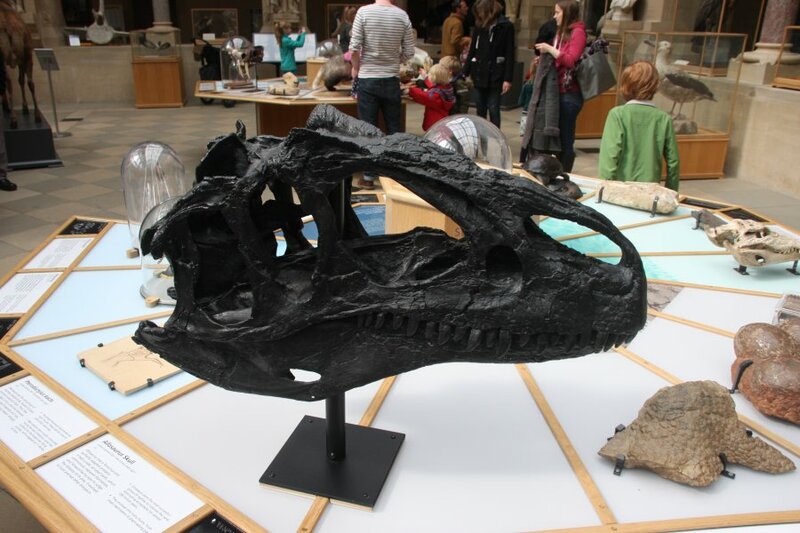 Allosaur skull; the Big Al cast. 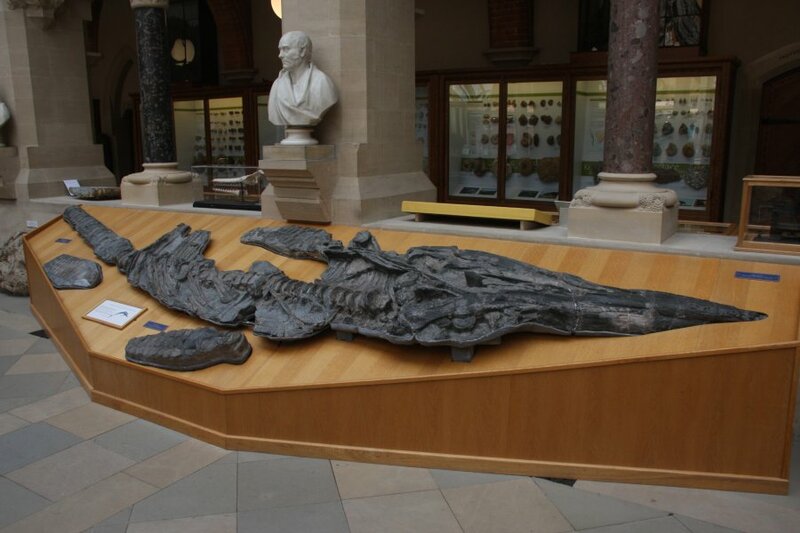 Peloneustes, a 5 metre pliosaur found at Yarnton near Oxford. These reptiles were most closely related to modern turtles. 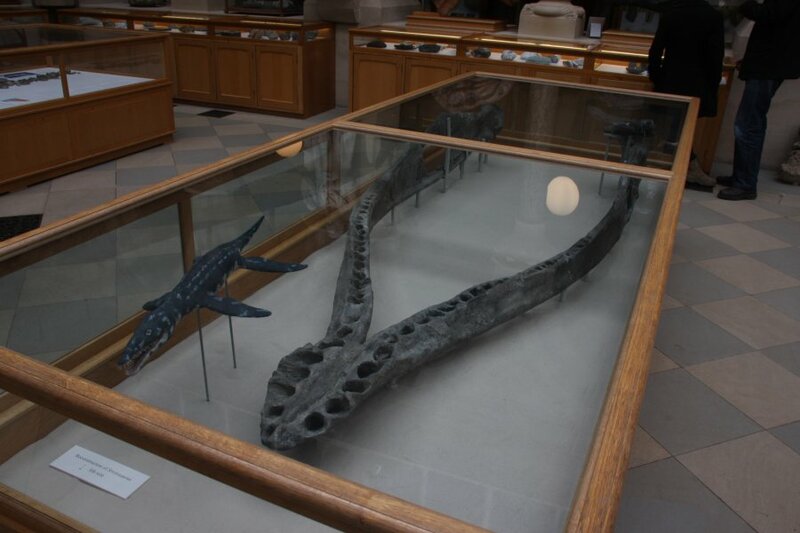 3 metre jaw of Stretosaurus macromerus, a 12 metre long pliosaur. 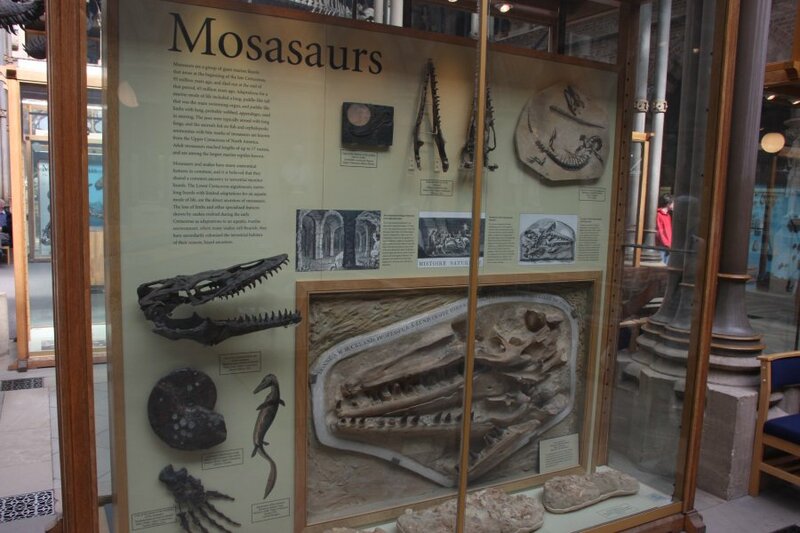 Mosasaurs, a type of reptile that falls into the same order of reptiles as lizards and snakes - basically a swimming lizard. 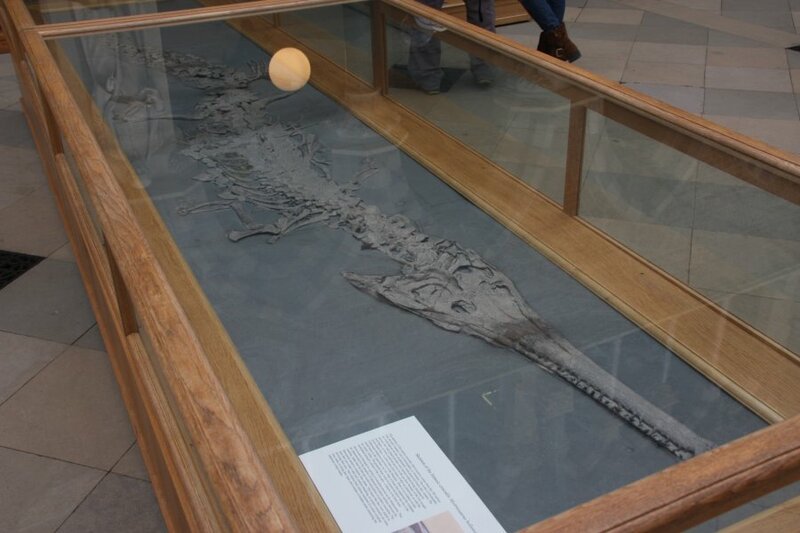 Temnodontosaurus platyodon, a 6 metre ichthyosaur, found in Dorset. Very similar to dolphins in appearence, and originating similarly from land animals. However, these are reptiles. Exactly which order gave rise to them is not yet known. 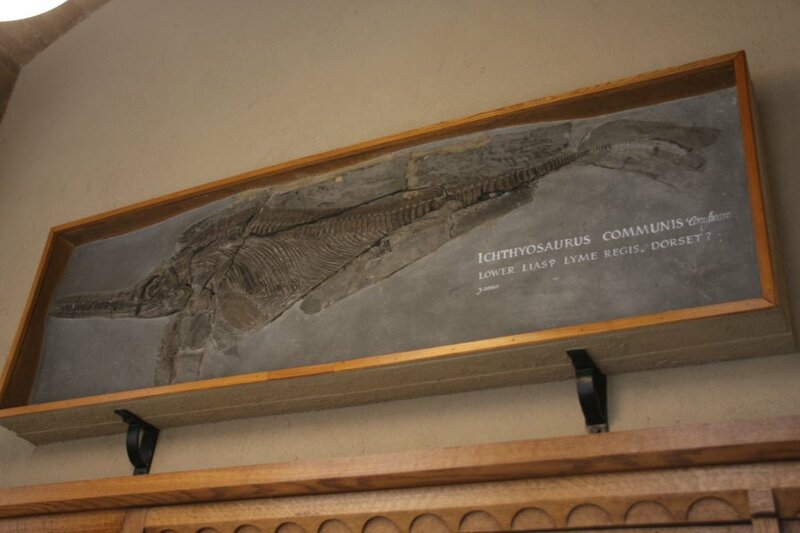 Ichthyosaurus communis, found in Dorset. 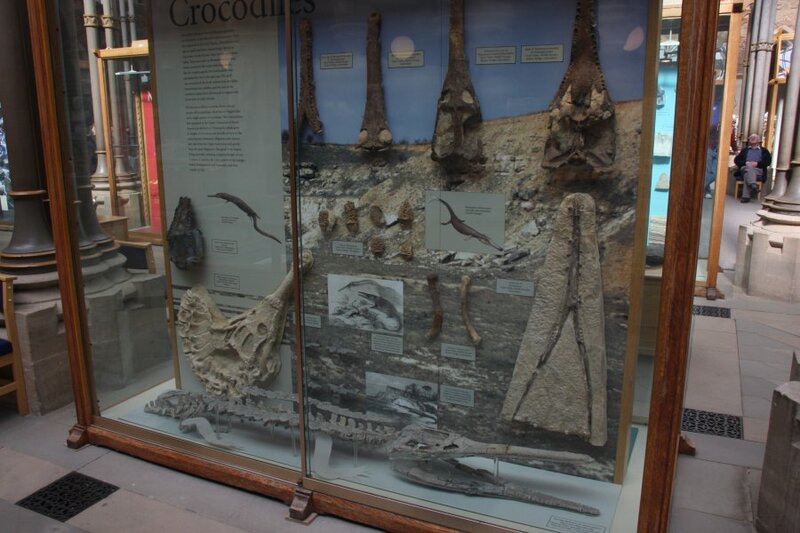 Fossils of multiple early crocodiles. 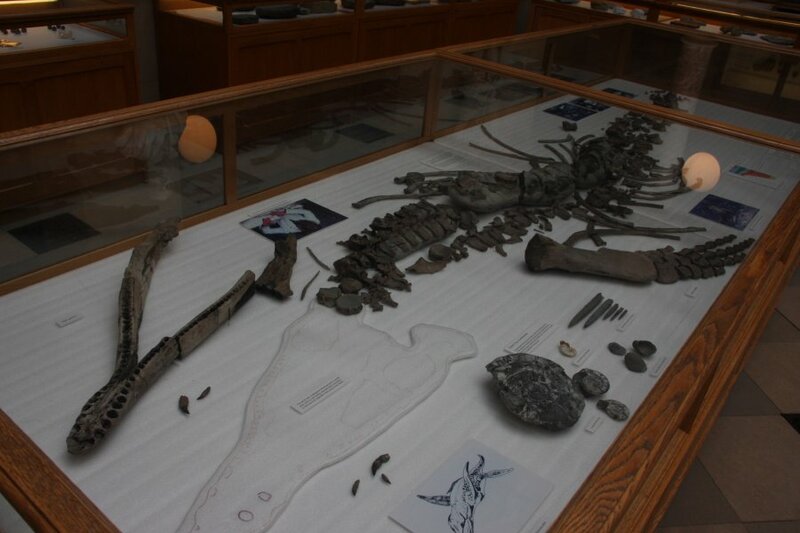 Mystriosaurus bollensis, another early crocodile. 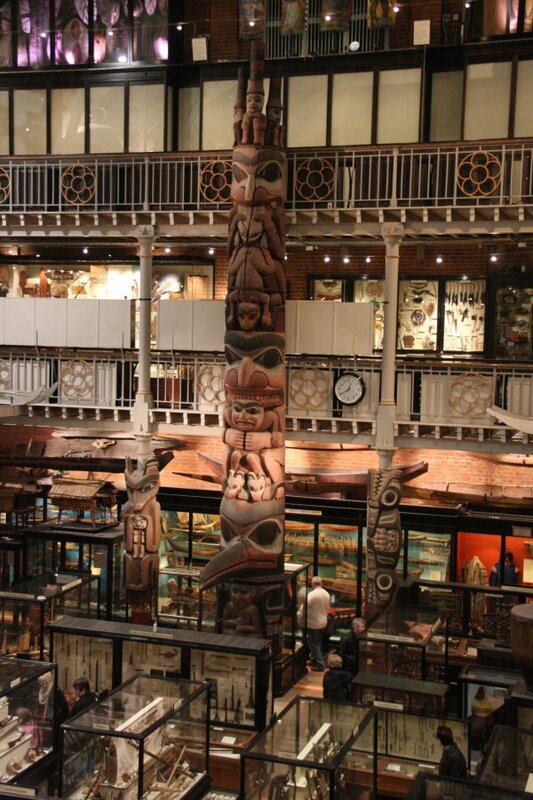 Haida totem pole, from Haida Gwaii island in Canada, in the Pitt Rivers Museum branch of the main museum. See the people for scale. This section of the museum is dedicated to human culture, weaponry, clothing and tools. The following pictures in this gallery may be a little disturbing. 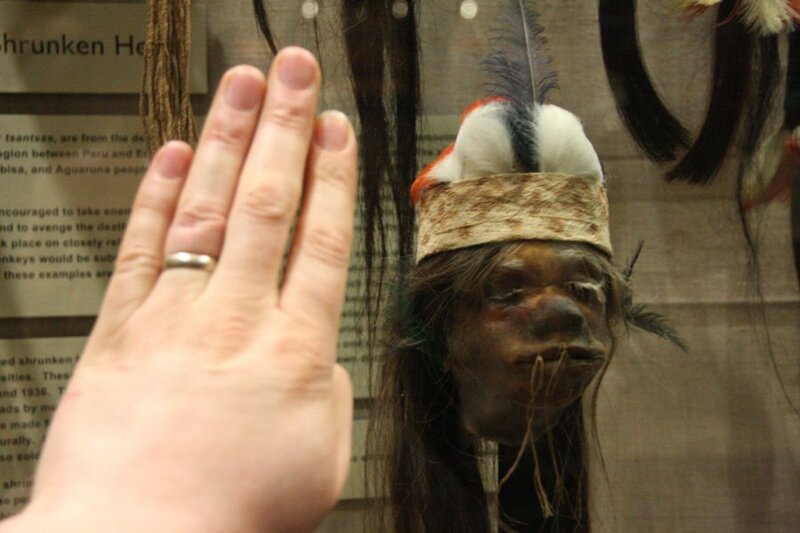 Shrunken head from Jivaro, Ecuador. This was once the head of an enemy, taken and prepared as a show of manhood or revenge. 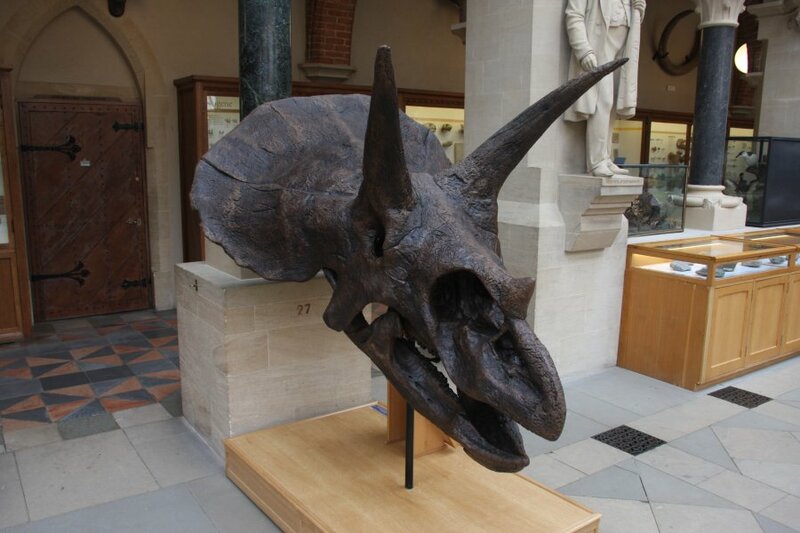 The skull is removed and replaced with a much smaller form to give the shape of the final head. Collected by the museum in 1934. 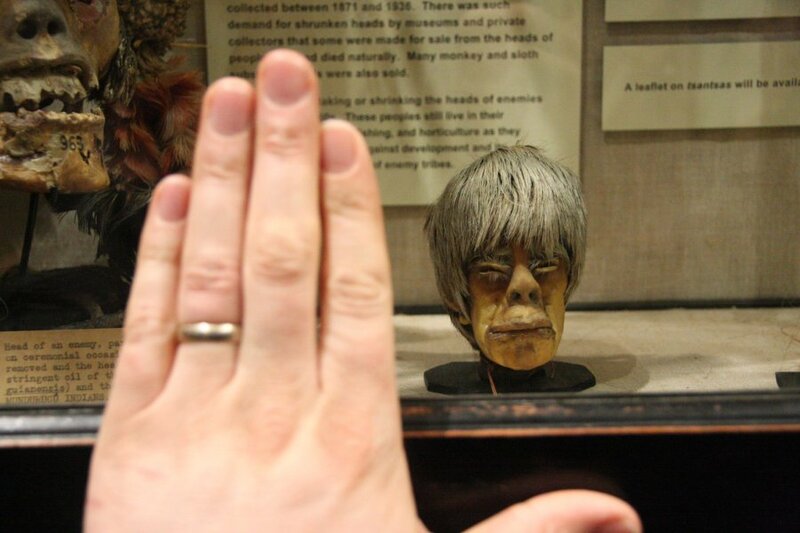 Another shrunken head from Jivaro, this time with the hair kept long. Collected by the museum in 1936. 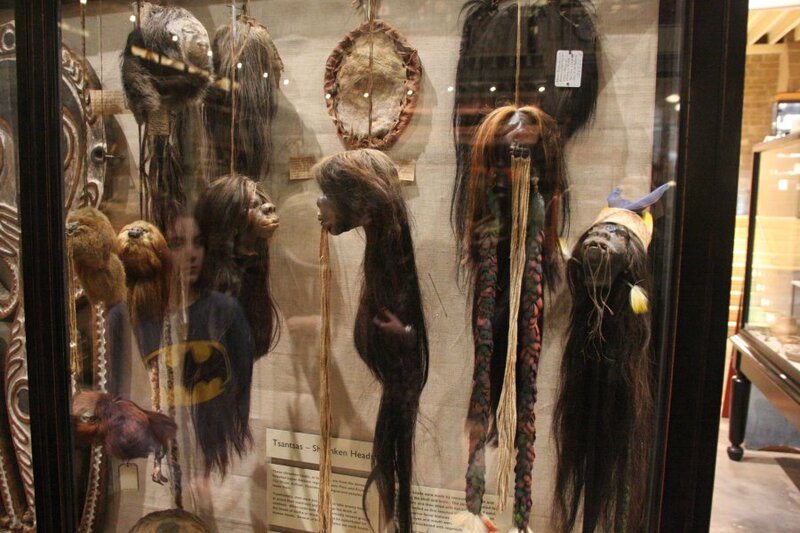 Tsantsas - shrunken heads. 4 appear to be human, the others are monkeys or sloths. Monkey and sloth heads. These would be made instead of human heads when the enemy was too closely related to the victor. 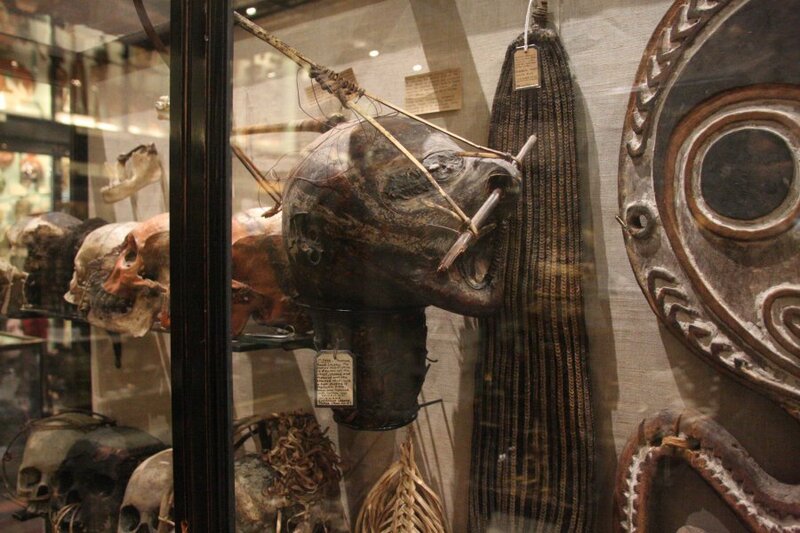 Saving the worst for last; Piforo, a gruesome human head trophy from Idigwako in Papua. 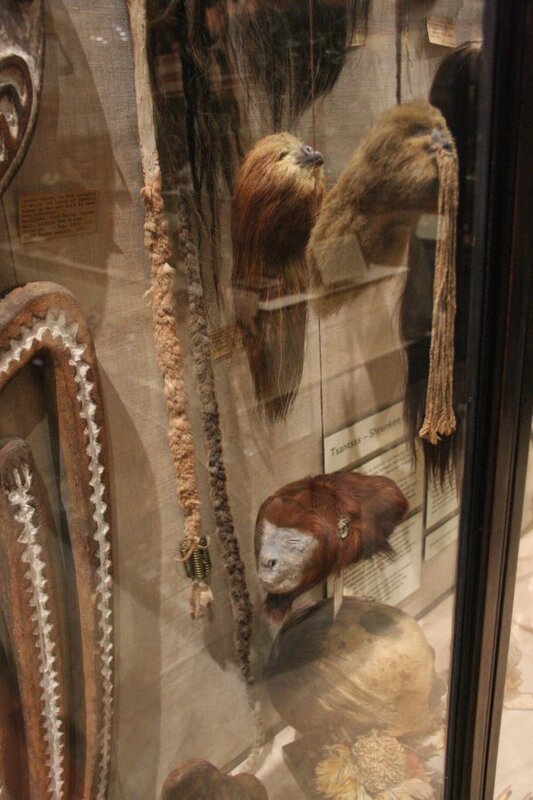 Unlike the shrunken heads, the skull is kept, and cleaned, with the cleaned skin stretched back over it afterwards.